Last year was a success for trade in Korea after the nation reached the so-called “triple crown” - a record high in annual trade volume, exports and trade surplus. It was the second consecutive year that Korea achieved a triple crown. According to data released by the Ministry of Trade, Industry and Energy on Thursday, the nation’s trade volume for last year posted a record high of $1.99 trillion - surpassing $1 trillion for the fourth straight year - thanks to low oil prices and successful sales of Korea’s flagship export items like semiconductors, steel, ships and handheld devices. In 2014, exports posted $573 billion, up 2.4 percent compared to 2013, while imports increased 2 percent to $525.6 billion. The country’s annual trade surplus was $47.4 billion. The government said the expanded exports to Korea’s major buyers - the United States, European Union and Asean - due to free trade agreements (FTAs) contributed to boosting the overall performance of exports. 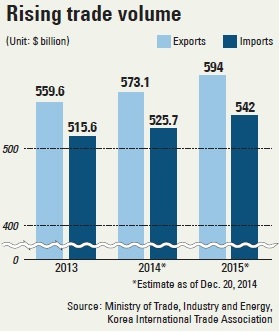 But Korean exports to Japan shrank 6.9 percent year-on-year due to a weak yen and the sluggish economy there. Semiconductors, steel and mobile devices were the three export items that saw the most growth. Semiconductor exports amounted to $62.7 billion in 2014, making it the first Korean product to ship more than $60 billion. Korean semiconductor exports marked $50 billion in 2010. The export volume of locally produced oil and petrochemical products surged in 2014 after oil production and refineries built by Korean companies opened last year. However, the recent plunge in oil prices resulted in 3 percent year-on-year drop in the value of petrochemicals. Memory chips, petrochemicals, automobiles, machinery and petrochemical products were Korea’s top five most exported items for the past two years. Korea will see exports rise further in all three trade categories in 2015, according to the Trade Ministry and the Korea International Trade Association, as the global economy improves and more FTAs come into effect. The Trade Ministry on Thursday estimated that Korean exports this year will be worth $594 billion, up 3.7 percent year-on-year, while imports will reach $542 billion, up 3.2 percent. Trade surplus is also expected to rise to $52 billion. But the ministry said it is worried that oil and petrochemical exports may shrink, though other flagship items like machinery, vessels and semiconductors will continue to lead the expansion of exports.